Due to the arid environment, water is definitely a limiting factor here, so metal detecting and drywashing are by far the most widely used methods for prospectors. In addition, it is worth mentioning that locating areas that are open and available for prospecting has become a difficulty in recent years, especially with the rising price of gold. There is lots of gold bearing ground, but there are also lots of gold seekers out there searching for it. Any prospector would be well advised to do the appropriate research and make sure that you are not prospecting on someone’s gold claim. With that said, there is no doubt that there are still plenty of areas that are not under claim that will still produce some nice gold. Additionally, joining one of the many local clubs is an excellent way to gain access to private claims where you can freely look for gold. Mentioning all gold bearing area within Arizona is quite an undertaking for one article, and will certainly not give the subject the detail that it deserves. Anyone who is serious about finding gold in Arizona would be well advised to seek out additional literature on gold in Arizona. In this article we will focus on the top 5 gold producing counties of the state. is in the central part of the state, and ranks as the top gold producer in Arizona. Lynx Creek District near Prescott is one of the richest areas of the state. It has been worked hard over the years, but gold can still be found. The majority of gold recovered from this area has been placer deposits. The Weaver/Rich Hill District has been one of the major producers in Arizona. Placers can be found at Weaver and Antelope Creeks. This area is very popular among metal detectorists, as it has a history of producing large nuggets. Big Bug District lies on the slopes of the Bradshaw’s, with several mines producing copper, silver, lead, zinc, and gold. The majority of gold from this district has come from lode deposits. The Jerome District is the largest producer within the county, with the vast majority of gold coming from lode. The Black Canyon District is in the southeast part of the county. Much of the historic mining was done during the Great Depression. Both placer and lode deposits are present here. The Agua Fria is found at the headwaters of the Agua Fria River. Most gold comes as byproduct of copper mining. Eureka District located near the town of Bagdad is home to several copper mines. The Bagdad Mine was one of the largest copper producers in the state at one time. Most gold has come as byproduct of the copper mining. The Hassayampa /Groom Creek District is on the west side of the Bradshaw Mountains near Prescott. Much gold has come from placers on the Hassayampa River and many lode mines. Additional gold districts in the county include Walnut Grove, Minnehaha, Granite Creek, Humbug, Martinez, Peck, and Tiptop districts. All of these have produced significant gold over the past 150 years, but much comes as byproduct of copper mines. Mohave County in the northwest corner of the state is the second richest gold producer in Arizona. The San Francisco District is southwest of Kingman. Extremely rich gold deposits were found here as early as 1863, and an estimate 2+ million ounces of gold have come from this area. Nearly all of this came from lode deposits. The Gold Basin District is located 50 miles north of Kingman, 10 miles south of the Colorado River. Most gold comes from lode deposits. The Colorado River itself has very fine placer gold present. The Wallapai District is primarily a producer of base metals such as lead and zinc. Much gold has been extracted as a byproduct, but nearly all has been produced on a commercial scale. The Maynard Mining District is found a few miles southwest of Kingman in the Hualapai Mountains. Placer gold found here has been noted to commonly be wire shaped specimens. In the northwestern part of the county, the King Tut placers can be found. Much of the rich gold areas are on private lands, but have been worked since the 1930s. Much of the gold is rough textured with quartz matrix, indicating a local source. Cochese County is the 3rd largest producer of gold in Arizona. The most significant region in the county is the Dos Cabezas District, which has produced significant amounts of gold. Lode deposits and placers are abundant. At the north end of the district is the Teviston placers, where much coarse gold has been found, with nuggets of several ounces reported. A dry land dredge worked the area from 1937 to 1940. The Dos Cabezas placers are also a source of placer gold, some of coarse texture. The Bisbee District is the largest gold producer in the county, but nearly all has come as a byproduct of other base metal mining. Small amounts of placer gold have been found at the Gold Gulch placer, about 4 miles southeast of Bisbee. The Huachuca District is found near the southern end of the Huachuca Mountains. Much placer gold has been found here, including some very large multi-ounce gold nuggets. A small amount of gold has come from the Gleeson Placers. Most of the best gold bearing land is privately owned. Yuma County in the southwest part of the state is the 4th largest gold producer in Arizona. The extreme heat makes placer mining difficult in the summer, but many prospectors converge on the area in the winter, when temperatures are mild. Gold is abundant throughout the county. The Dome District, or Gila City placers, is located at the northern end of the Gila Mountains east of Yuma. This area has been worked extensively since 1858, and most paying gravels have been reworked at least once. Many nuggets have come from the area, but distribution is known to be spotty. The Laguna District is located at the southern end of the Laguna Mountains. The Las Flores area has many placer deposits with noted quartz outcroppings. The Muggins Placers are found at the central and southern end of the Muggins Mountain Range. Castle Dome District produced mainly lode gold. Some placers are present south of the Big Eye Mine, northeast of Dome. Most gold from the Kofa District in the central part of the county came from just a few large lode mines. Limited placer mining has occurred here. The La Paz District is located about 10 miles west of Quartzsite. This area was mined extensively, but limited water resulted in crude methods and much gold was lost by the early miners. Much gold has been found by metal detectors in recent years, although the area around Quartzite is known to have been worked extensively. The Plomosa District is near Quartzite, between the Plomosa and Dome Rock Mountain. Mainly placer gold has come from this district. Maricopa County is the 5th largest gold producer in the state. Most gold production has come from lode deposits. The Vulture District is on the south side of the Vulture Mountains. Nearly all gold was lode from this district. Just a few hundred ounces of placer have been reported. The San Damingo and Hassayampa placers near Wickenburg are good producers of placer gold. The Red Picacho Placers are also very productive. The Cave Creek District northwest of Phoenix produced extensive gold, nearly all from lode mining. Gold has been mined in all areas of Arizona. Much of the total production comes as a byproduct of copper mining, but placers are also found throughout the state with abundant gold still waiting to be found. Due to the lack of water, drywashers and metal detectors are the key pieces of equipment used here. For additional information and resources about gold mining in Arizona, check out our recommended reading page. 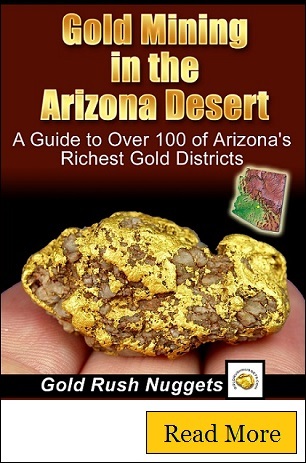 There are several books on the market that go into great detail about the numerous gold districts in the state of Arizona.